When someone mentions the word “thrash,” there’s a good chance one of the bands that comes to mind is “The Big Four”: Metallica, Slayer, Anthrax, and Megadeth, and for good reason. Each mastered a distinct style while sharing the same love of all things fast and heavy. Their peers in Overkill have been around just as long, slaving away with their own blend of workhorse thrash, and yet their 18th(!) album, The Grinding Wheel, is my first exposure to them. While it’s far from perfect, it certainly sounds a lot more vital than most 80s bands releasing new material 30-odd years later, and should serve well to continue their against-all-odds late-career resurgence. Leadoff track “Mean Green Killing Machine” marches in with a slow-but-heavy drum beat and chunky riff that instantly calls up a little of both Megadeth and Meshuggah before building into a classic thrash riff with a natural head-bobbing rhythm. Vocalist Bobby “Blitz” Ellsworth‘s voice is a little off-putting at first, but his similarity to Dave Mustaine’s nasally screech fits a great deal of their songs better than this one. Around the midpoint, the tune settles into a lighter groove complete with a borderline monastic background chant. I wish it stayed there longer, but hearing it tear back into that intro riff again is nice too. “Goddamn Trouble” follows with a galloping punk drum beat (a feature that Overkill are aware is one of their strong suits), and the entire song is fast and reckless, but played with machine precision. The result sounds kind of like Megadeth covering Motorhead. “Our Finest Hour” shares a similarly punk drum beat (although not many punk bands out there can splice blastbeats into the mix as handily as drummer Ron Lipnicki), and while the riff is undeniably thrash, the darker tone recalls Helmet’s 90s heyday, making this the standout song of the album. It doesn’t hurt that chorus hook is a real sing-along earworm, and the blistering solo at the song’s climax will gets horns thrown in the air for sure. “Shine On” and “The Long Road” share a lot of the same strengths and issues; both songs have impressive solos (“The Long Road” even throws a Steve Vai inspired shred fest in before the first verse), decent technicality, and a noticeable love of Iron Maiden, but both also lack memorable hooks. “Let’s All Go To Hades” fixes that in a hurry, with a doom-laden intro and the most fun vocals on the album (pairing a falsetto screech from Blitz with accompanying gang vocals). This is by far the catchiest song on the album, enough so that the hokey lyrics get a pass. “Come Heavy” surprises with a little bit of swing and groove to the sound, although it still comes across as a Megadeth B-side. “Red White And Blue” exits the Megadeth/Anthrax wheelhouse and borrows a little bit of early Metallica feel for the riff, and Blitz provides a pretty impressive Rob Halford impersonation to carry the song. It’s derivative as all hell, but it’s different enough to sound very welcome late in the album. “The Wheel” is straight-up power thrash, and while it’s executed with proficiency, it once again struggles to find a hook to sink your teeth into. 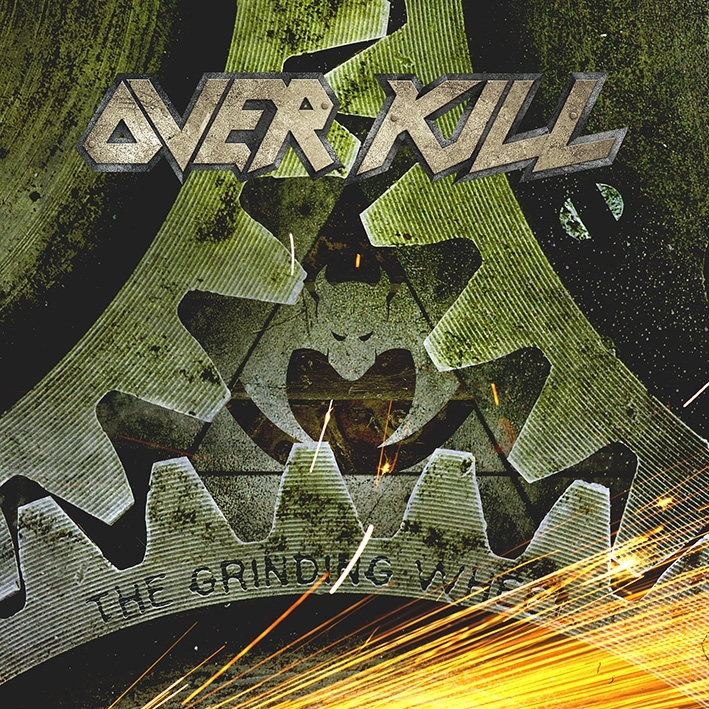 Overkill fittingly add some grind for the title track finale, which starts off sounding (again) like a good Megadeth track (think an album cut from the Peace Sells era), but it travels to some places a little too experimental for Megadeth, with a soaring, epic chorus out of the Iron Maiden playbook, and then a pummeling shift into a warp-speed thrash bridge. It loses a little momentum with the brief bass-led instrumental interlude, but comes back strong with a giant sludge riff and chiming church bells accompanied by deep, unsettling choral chants. It’s a perfect counterpart to the equally eclectic opening track, and a great way to close things out. I feel kind of bad for Overkill. They have talent, they have interesting ideas (some of which work and some don’t, but isn’t that every band? ), and they have the bad luck of sounding just a little bit too much like Megadeth (vocally) and Anthrax (musically). That’s not at all a bad thing for anyone who enjoys good ol’ thrash music, and it certainly doesn’t feel like these 10 songs take up over an hour of time. For a band 37 years into their career, solidly within a genre that passed its peak more than two decades ago, to release an album this good is rather stunning.